Simple and inviting with a little sweetness, this Crunchy Napa Cabbage Salad is one of our regulars this time of year. 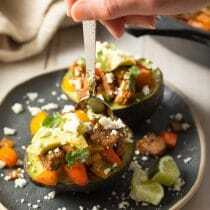 I’ve been meaning to share this salad recipe with you for quite some time. It’s the salad we make more often than any other. 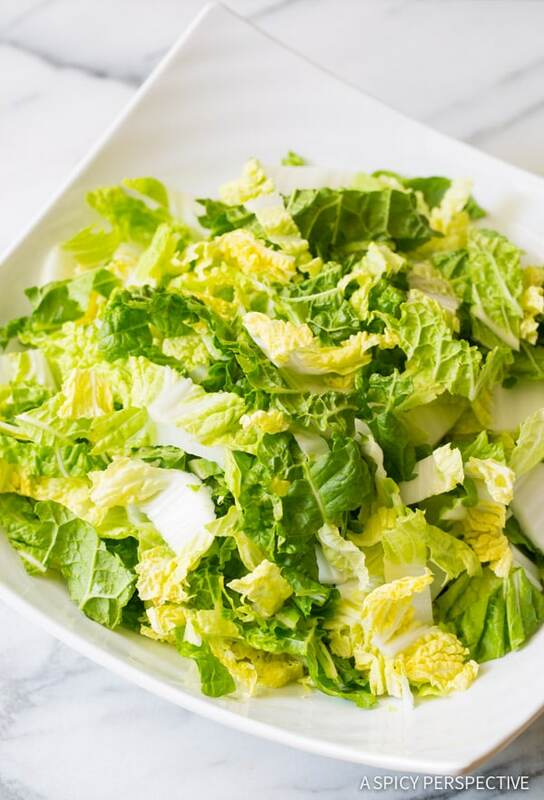 We call this addictively Crunchy Napa Cabbage Salad Carson’s Salad, because my son Carson (age 10) asks for it nearly every week. 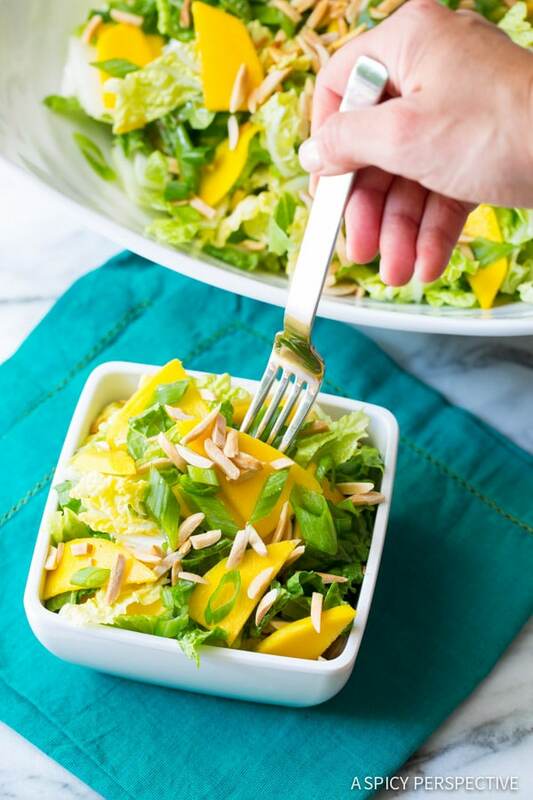 He loves the crisp texture of the napa cabbage with the sweet silky mangoes. 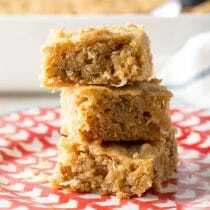 Sprinkle toasted nutty goodness and green onions over the top and you have a simple salad kids crave! I toss this crunchy napa cabbage salad with a perky vinaigrette that is just as easy to make. It’s a blend of mild rice vinegar, oil, honey, plus a little sesame oil for flavor. Light and zippy… the perfect complement to this crisp cool salad. No wonder Carson asks for it so often. Of course, I’m always happy to oblige a child begging for salad. I try to keep napa cabbage and mangoes on hand, all the time. He even makes this crunchy napa cabbage salad for himself sometimes. On occasion, we throw in cool cucumber slices and a little sriracha hot sauce in the dressing just to kick things up. When my children are in the kitchen, I’m always thankful for my kid-friendly crack resistent dinnerware from Q Squared NYC. 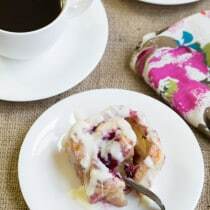 They can carry around the melamine Diamond White Bowls and our Q Zen Serving Bowl without concern. 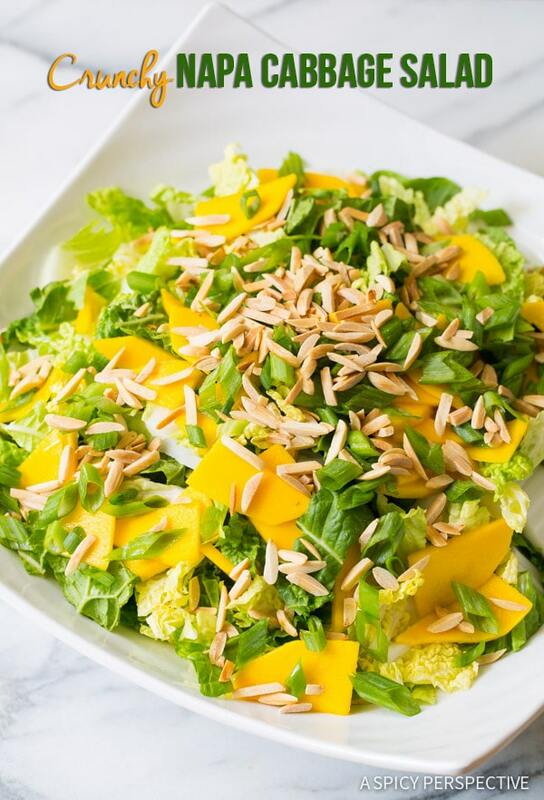 Crunchy Napa Cabbage Salad with mango and toasted almonds. This easy asian-style salad is a favorite with the kids. Roughly chop the napa cabbage and pile in a large serving bowl. Peel and slice the mangoes and scatter over the top of the cabbage. Chop the green and white ends of the scallions and sprinkle over the salad. Then sprinkle the toasted almonds on top. Pour the rice vinegar, oils, and honey in a small bowl. Whisk well and season with salt and pepper. 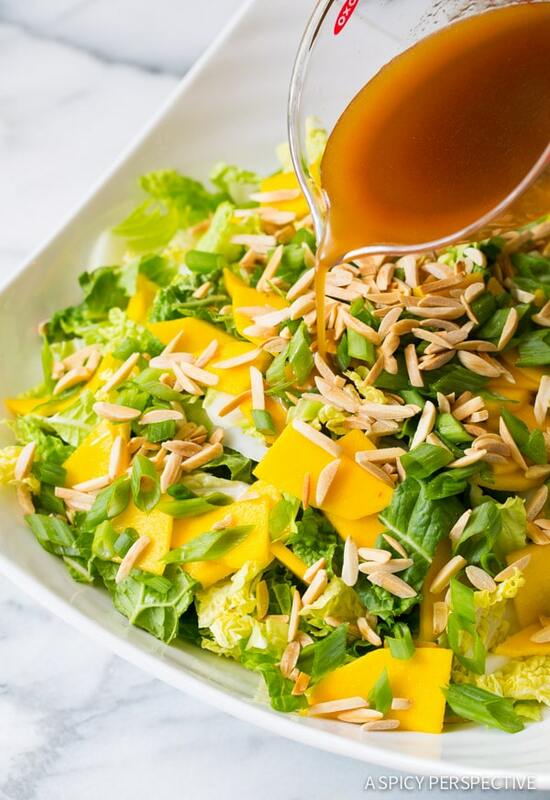 Pour the vinaigrette over the salad and toss. Variations: Sometimes we add sliced cucumbers, sesame seeds, or even sriracha to the vinaigrette to kick things up. Disclosure: I’m a Q Squared NCY product ambassador. All opinions are my own. I think I’d faint if my boys ever requested salads :) But this is one I wouldn’t want to share anyway! Love all those crunchy textures in this salad! 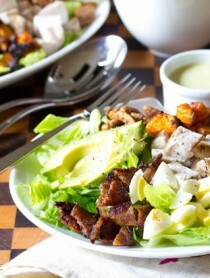 I’m with Carson, all the different textures in this salad have me wanting to try it asap! wonderful flavors Sommer! I just love big salads in the summer! 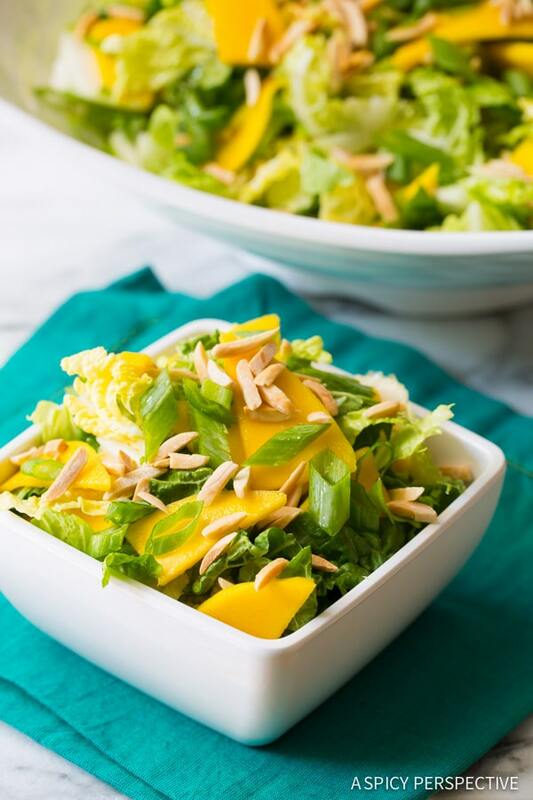 Love mangoes in salads! 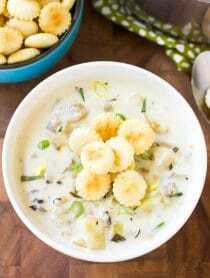 This looks so simple and refreshing! Perfect for summer! 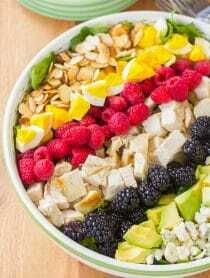 Great looking fresh summer salad! Oooohh…..big fan of napa cabbage! 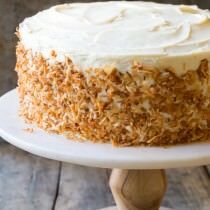 Love the crunch! It looks so crunchy and has the perfect textures for a salad! 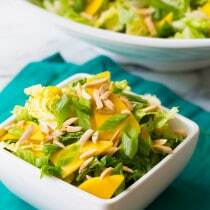 Love this crunchy salad! Great for any occasion! !